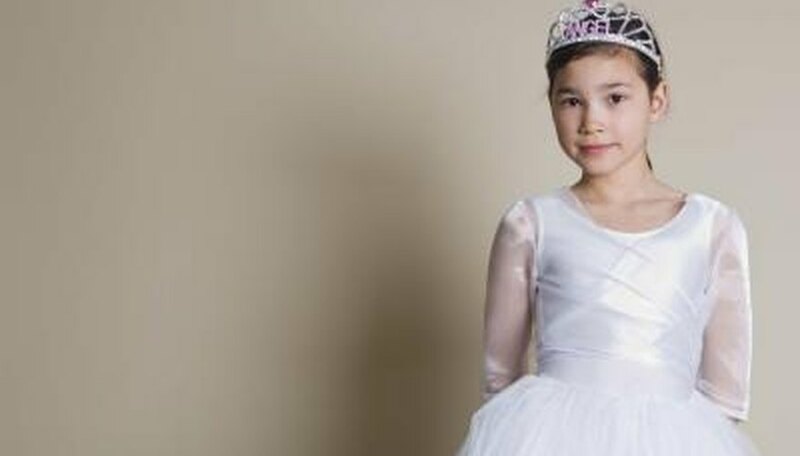 A popular choice in costume and dress-up fun, princess dresses come in many styles and designs. While the more complex, time-consuming styles are often relegated to Renaissance fairs and costume conventions for the serious stitcher, there are plenty of easy styles available to novice or occasional hobbyists, or to those needing to quickly throw together a princess dress for a party or play. Whether your princess is big or small, an easy princess dress will provide hours of fun, fantasy and frivolity. To make a princess dress, follow the instructions in this article. Choose a princess dress pattern that suits your princess's idea of what she should look like. Some easy, versatile patterns for children are McCall's M5494, M502 and M2856, all of which offer a variety of options for skirts, sleeves and bodices. A more complex child's princess dress is McCall's M5731. For an adult, Renaissance costume patterns like McCall's M5647 or M5444 are the best option. You can also create a princess dress out of any sundress pattern by lengthening the skirt, adding sleeves, and decorating the dress with ribbons, bows, ruffles and other trimmings. Measure the child or adult that the dress is for, using a measuring tape. Be sure to take measurements at the bust, waist, hip, center front and back, and a rough estimate of how long the skirt and sleeves should be. Make sure to leave a few extra inches in the length to account for any mistakes. Find the pattern size that fits the largest part of your princess and scale it down from there, using the pattern's sizing guidelines. Cut the pattern pieces. Make a mock-up, or practice version, of your chosen pattern using cheap muslin material, usually found in the back of the fabric store's cotton broadcloth section. Pin the pattern pieces to the muslin and cut, then sew the fabric together as directed in the pattern instructions for the pattern that you chose. Put the dress on its intended wearer a few times during this process to assess the fit and make adjustments as necessary. Remake the dress in the princess fashion fabric of your choice. If you have made many adjustments to the mock-up version, you may wish to forgo using the original pattern and instead take the mock-up apart at the seams to use as a more accurate pattern. Sew the fabric together the same way that you did the mock-up. Before finishing hems, put the dress on your princess and determine how long they need to be. Hem the dress and finish all seams. Add embellishments to the dress, as desired. These may include ribbons, bows, flowers, ruffles, fancy trim, beads and sequins. Purchase or make any accessories you would like, such as shoes, crowns, tiaras, scepters and gloves. Some embellishments can be hot-glued to the dress, depending on the fabric used. Synthetic fabrics usually melt with hot glue.